The BBC is today announcing that Matt Smith is to leave Doctor Who after four incredible years on the hit show. 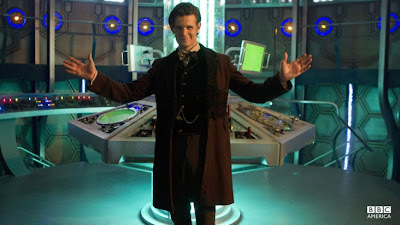 Matt first stepped into the TARDIS in 2010 and will leave the role at the end of this year after starring in the unmissable 50th Anniversary in November and regenerating in the Christmas special. During his time as the Doctor, Matt has reached over 30 million unique UK viewers and his incarnation has seen the show go truly global. He was also the first actor to be nominated for a BAFTA in the role. Doctor Who is BBC AMERICA's highest-rated series and premieres as part of the channel's Supernatural Saturday programming block. Matt quickly won over fans to be voted Best Actor by Readers of Doctor Who Magazine for the 2010 season. He also received a nod for his first series at the National Television Awards, before winning the Most Popular Male Drama Performance award in 2012. Matt has played one of the biggest roles in TV with over 77 million fans in the UK, US and Australia alone! "Doctor Who has been the most brilliant experience for me as an actor and a bloke, and that largely is down to the cast, crew and fans of the show. I'm incredibly grateful to all the cast and crew who work tirelessly every day, to realize all the elements of the show and deliver Doctor Who to the audience. Many of them have become good friends and I'm incredibly proud of what we have achieved over the last four years. Having Steven Moffat as showrunner write such varied, funny, mind-bending and brilliant scripts has been one of the greatest and most rewarding challenges of my career. It's been a privilege and a treat to work with Steven, he's a good friend and will continue to shape a brilliant world for the Doctor. It's been an honor to play this part, to follow the legacy of brilliant actors, and helm the TARDIS for a spell with 'the ginger, the nose and the impossible one'. But when ya gotta go, ya gotta go and Trenzalore calls. Thank you guys. Matt." Steven Moffat, lead writer and executive producer, says: "Every day, on every episode, in every set of rushes, Matt Smith surprised me: the way he'd turn a line, or spin on his heels, or make something funny, or out of nowhere make me cry, I just never knew what was coming next. The Doctor can be clown and hero, often at the same time, and Matt rose to both challenges magnificently. And even better than that, given the pressures of this extraordinary show, he is one of the nicest and hardest-working people I have ever had the privilege of knowing. Whatever we threw at him - sometimes literally - his behavior was always worthy of the Doctor. Having starred alongside three different companions, Amy Pond (Karen Gillan), Rory Williams (Arthur Darvill) and most recently Clara Oswald (Jenna Coleman), Matt's Doctor has fought Daleks and Cybermen, as well as Weeping Angels in New York. Regularly heard shouting 'run' and 'Geronimo', through Matt's Doctor fans have been introduced to a new culinary combination - fish fingers and custard! Matt's spectacular exit is yet to be revealed and will be kept tightly under wraps. He will return to BBC AMERICA in the unmissable 50th anniversary episode on Saturday, November 23, 2013 - TUNE IN!